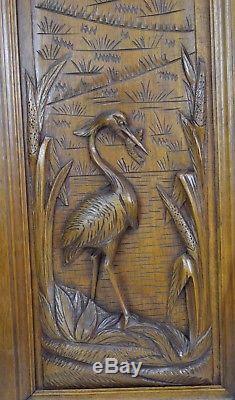 French Antique Carved Heron Bird Wood Cabinet Door Panel - Fishing Cabin Decor. 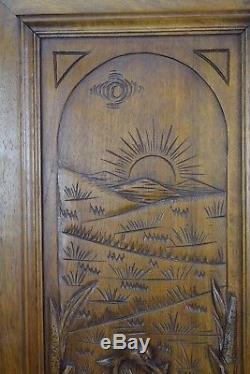 A charming French antique door made of hand carved walnut wood. 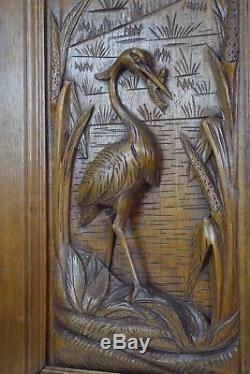 The lake decor finely features a lovely heron or lake bird fishing. This door would be perfect in your fishing cabin. 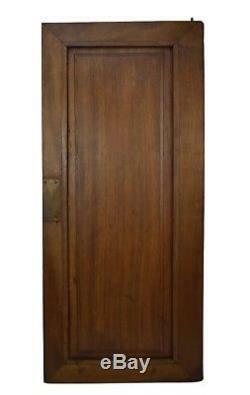 This nineteenth century door can be used as wall panel or as a cabinet door. This door is in good antique condition with some normal signs of ages. Please take a close look at the photos. Height: 29 1/8 (74 cm). Width: 12 7/8 (32.8 cm). You can find the matching door in our shop! Thank you for checking my others items, a large choice of French and antique religious, wood, porcelain, cutlery, majolica, bronze.. Charmantiques is a family-owned business of antiques specialized in French antiques from the 18th Century to the mid-20th Century, located in France. We are antique dealer for 20 years and third generation antique restorer. Each wooden work of art is meticulously restored by the book. Charmantiques only provides high quality French antiques. Each pieces is carefully selected. We only sell online, for 15 years now and have 100% positive feedbacks. But we will be happy to receive you by appointment in our Provence or Burgundy home. At Charmantiques, we always do our best to please you. Do not hesitate to ask us any questions you may have. We will answer 7d/7 within 24hours. Our Guarantee : Authenticity, Quality, Ecology. We guarantee the authenticity of all of our items. Our objects are cleaned and professionally restored to be the closest to their original condition. Upon your request, we can send you an authenticity certificate resuming the item description. We guarantee that our items with animal or vegetal materials regulated by the Washington Convention of 1970 date from a very earlier date. But we want to do more and we guarantee that we use, when possible, recycled boxes and biodegradable packages. As we are professionals, we sell online on others sale websites and on our own website : Charmantiques. So we can remove items at any time. Thank you to pay within 7 days. Charmantiques answers 7d/7 within 24hours. We appreciate very much your patience. What happen if you did not receive your order? Fortunately, it did not often happen. Thank you so much for your patience. You need to make a very detailed written report. Moreover if it is possible, please open the parcel in front of the deliver to check that the item is safe. They are not included in the price. For the USA, all antiques of more than 100 years old are not taxed. If you are not satisfied with any item you receive and you want to return it, please notify us within 7 days. And do not forget to mention on the custom declaration that it is a RETURN. 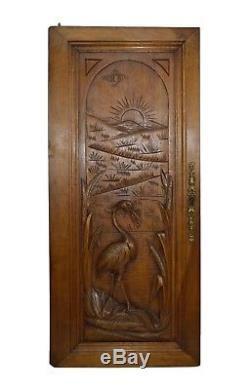 The item "French Antique Carved Heron Bird Wood Cabinet Door Panel Fishing Cabin Decor" is in sale since Thursday, January 25, 2018. This item is in the category "Antiques\Architectural & Garden\Doors". The seller is "charmantiques" and is located in Aloxe Corton. This item can be shipped worldwide.